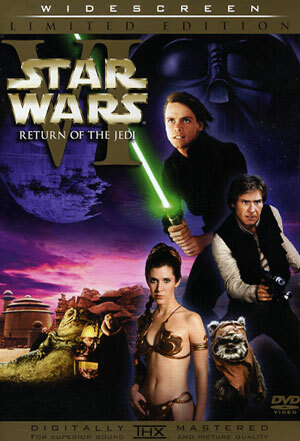 Star Wars Episode VI: Return of the Jedi is the epic conclusion to the greatest film franchise of all time. At least, until 2015 comes around. George Lucas had previously planned for Episode VI to be a mere continuation of the saga, having the episode be a bittersweet ending that would lead in to VII, VIII and IX. However, he had a change of heart at one point, which led to Gary Kurtz be kicked out of the producers seat. Kurtz has since then been on a vendetta against George, accusing him of being ''greedy'' and in favor of the marketing of toys instead of the films. In all honesty, over the years George has proven to be anything BUT a greedy man, which only shows that Kurtz accusations and the hateboys efforts have been a colossal waste of time. Anyway, going back to Episode VI. At this point, Palpatine is near final victory in his quest to purge the galaxy from adherents of the light side. Now that the second Death Star has been in construction for a few years, and is reaching near completion, he has personally allowed for the Bothan spies to know the location of the Death Star, in order to lure the Rebel fleet in a battle that will destroy them, and seduce Luke Skywalker into the dark side, therefore replacing the ill and robotic Darth Vader. Palpatine has always achieved his evil and diabolical goals in the past, why should it be any different now? Darth Vader in the meantime, has every intention of joining with his son in order to defeat the Emperor. Both of them have the Sith Rule of Two in mind, but the difference is, that while Darth Sidious demonic soul only wants to finally achieve victory for the Sith and the dark side, Vader is beginning to feel conflicted in the inside regarding what he should do. On the other side of the galaxy, while Admiral Ackbar and Mon Mothma are preparing themselves against the decisive fight over the control of the galaxy, Leia, Luke, Lando, Chewie and the droids are over at Tatooine figuring out how to free Han Solo from the clutches of Jabba the Hutt. Lando entered firstly undercover, and later the droids would follow as a way to see if Jabba would give Han. After he refused and kept the droids, Leia had to enter disguised as a bounty hunter, with Chewbacca as a ''prisoner'', in order to free Han. Leia would later take the droids and Chewie, with the help of Lando. Since that also failed, Luke Skywalker, as a near trained Jedi had to come and bargain by force with Jabba. Luke then falls into a pit and faces the monstrous rancor, only to end up killing him as he chokes with the door. Han, Luke and Chewbacca are all sentenced to death, to be eaten by the Sarlacc. Once R2-D2 releases Luke's lightsaber, and Luke uses it, we clearly see that in the interim between Empire and Jedi, Luke has gone into training of his own. The EU goes off to reveal that Luke went into Obi-Wan's home in Tatooine and uncovered a journal that allowed Luke to continue his training, and had instructions into the construction of a lightsaber. Boba Fett dies in the most comedic way possible, something undermining for such a serious character. Jabba also dies at the hands of slave Leia. Leia, Han, Lando and Chewie go to reunite with the rest of the Rebel fleet. Luke meanwhile, goes to Dagobah in order to fulfill his promise to Yoda. Yoda on the other hand, is very ill at this point, facing death at the age of 900 years. He talks with Luke for one last time, confirming Vader's parentage to Luke, and reminding him that he is the last of the Jedi. After Yoda vanishes, Luke talks to Obi-Wan's Force Ghost. He gives us the famous A Certain Point of View line, reveals that Luke is Leia's sister, and says that he must defeat Vader and the Emperor in order to be a full fledged Jedi. Luke however, believes he can redeem his father. Luke then arrives and meets with the other Rebels, in order to plan their battle. The Big Three along with Chewie and the droids must go into the Sanctuary Moon of Endor in a stolen Imperial Ship in order to infiltrate the shield that is protecting the Death Star and destroy it. Along the way in Endor, they meet with the Ewoks, a strange group of beings all the size of a 6 year-old. The Rebels ally with the Ewoks in order to infiltrate the shield generator. In the night before the epic battle, Luke must go into the Death Star, and fulfill his destiny as a Jedi. Before he goes however, Luke tells Leia about not only her parentage, but their relation as siblings. Leia is obviously affected by this, as Luke leaves to the unknown. The Battle of Endor begins the next day. Admiral Ackbar and Lando Calrissian using the Millenium Falcon are ready to lead the Alliance into victory. As they realize that the shield generator is still up, they are forced to attack the Imperial Fleet first. Han, Leia and Chewie lead the fight with the Ewoks to infiltrate the shield generator and destroy it. Neither fight goes well at first, since the Death Star destroys two Rebel cruisers, and the Ewoks have several casualties. Palpatine meanwhile, is in his tower on top of the Death Star, seeking to turn Luke into the dark side, telling him that the only way to save his friends and family from dying in battle is to join him, much like how his father was turned decades back. Luke faces uncertainty, and despite the fact that he can overpower his father in combat, he isn't sure of what to do. Darth Vader, feels even more conflicted as the story progresses. Han Solo, then with the help of Chewie, figures out how to trick the Empire and enters the shield generator. After implanting some bombs, the shield gets destroyed, and Lando along with Wedge and other Rebel pilots charge deep into the heart of the Death Star, in order to destroy it. Darth Vader meanwhile, discovers that Leia is Luke's sister after reading his mind. Once Vader threatens to turn Leia to the dark side, Luke reacts violently, defeating his father in confrontation. and caling the attention of Sidious. Sidious orders Luke to kill his father, and finally embrace his apprenticeship to the Order of the Sith Lords. Luke looks in disgust to see that Darth Vader had a robotic hand, much like how he also has one. He realizes in horror, how his vision in the cave of Dagobah of becoming another Darth Vader is becoming more and more real. He then rejects the dark side of the Force and declares himself a Jedi, like his father before him. Palpatine gets upset to realize that the ultimate apprentice won't turn, so he decides to electrocute him with Force lightning. As Luke Skywalker stands on the door of death, his father realizes that Luke is the only person who ever loved him that has a chance of being saved. That's when Darth Vader returns to being Anakin Skywalker, and throws Emperor Palpatine down a reactor shaft, destroying the Sith Lords once and for all. Of course, Anakin's sacrifice comes at a high cost, having his own lung respirator largely damaged. He tells Luke to take his mask off, in order to look at him with his own eyes. Once that happens, Anakin says his final words to Luke, before he dies. Luke manages to escape the Death Star on time, as Wedge and Lando blow up the Death Star on time. Han and Leia declare their love for each other, while Luke burns up his father in a Jedi-type funeral. 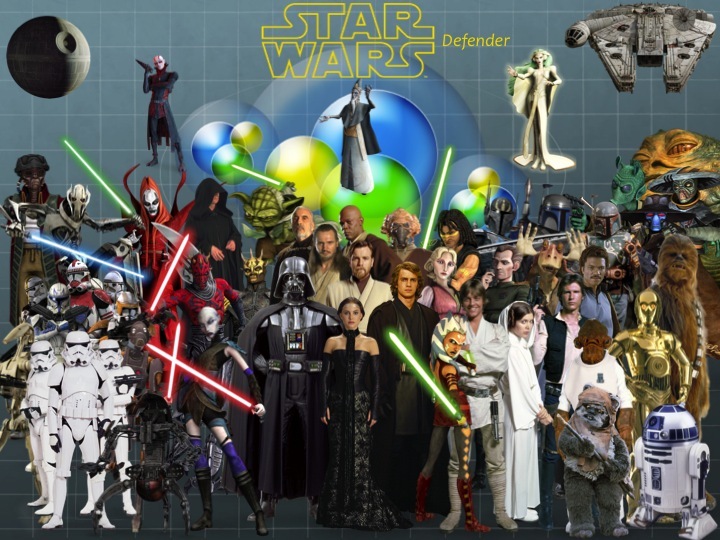 As we see, various planets around the galaxy, including Naboo, Coruscant and Tatooine celebrate the victory of the Rebel Alliance over the Empire, and the restoration of democracy into the galaxy. As the Rebels celebrate on Endor, Luke notices the force ghosts of Yoda, Obi-Wan and a younger Anakin Skywalker. The Jedi have returned. Return of the Jedi is by far my favorite Star Wars film. It's a great way of ending a mythic saga that tells us in the end that good will prevail over evil, that their is a transcendence beyond the universal tragedy of man, one of redemption and hope, that lives on in many of the worlds mythic traditions. Star Wars brings up that concept, and no better example exists of that than Return of the Jedi. 1. The entire sequence in Jabba's Palace and the Sarlacc pit. It has always been one of my favorites. 2. The arrival of the Emperor, the death of Yoda, and Obi-Wan's conversation with Luke. 3. The Space Battle of Endor, including the ''It's a Trap'' moment. 4. The Fight Between Darth Vader, Luke and the Emperor. 5. Vader's redemption and his death. Makes me tear up every time.